Dean’s has a dark brown/black coat that first appears in The Benders (1x15). The coat has two front breast pockets, but besides the flaps covering them, there are no pocket seams. The coat also has two pockets at the bottom that sit on a nice angle, with only a small seam at the opening to indicate they are there at all. The coat's collar is lined with black fleece and looks quite cozy. It also has cuff straps and two visible snaps at the collar. This coat can also look remarkably blue. Reliable sources inform me that this coat is GREY. Wow, that's one mystery solved. In The Benders (1x15), Dean picks up the coat from the back of his chair in the bar just before heading to the bathroom. He leaves the bar wearing it, and does not take it off for the rest of the episode. The Benders briefly remove it when they tie Dean to a chair and torture him, but Dean is able to recover it after Sam rescues him from the thirteen year-old girl keeping him captive. In Provenance (1x19), Dean wears it back to the auction house to “look for his wallet” and then uses it as his main coat for the rest of the episode except the goodbye scene. He also takes it off whenever he is in the motel room. In Roadkill (2x16), Dean wears it from when they encounter Molly on the road until the end of the episode (he is not wearing it during the flashbacks to before they encountered Molly though). 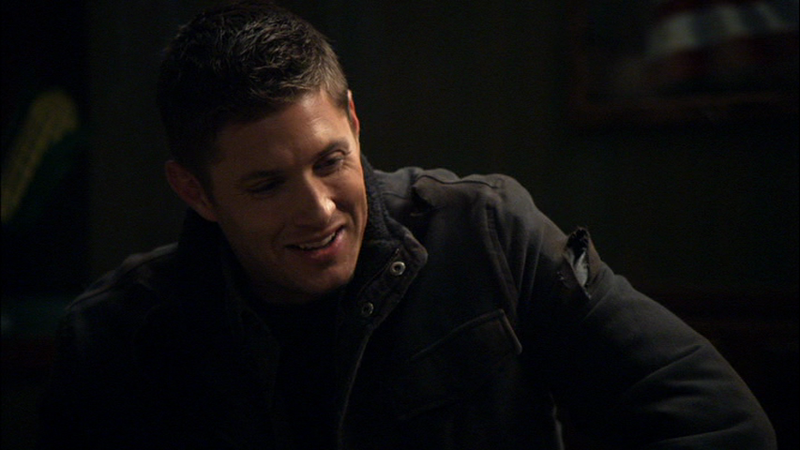 In Fresh Blood (3x07), Dean wears this jacket the entire episode – except we see him take it off whenever he enters the motel room, and at the very end of the episode, when they are working on the car, he is not wearing it. In Time Is On My Side (3x15), Dean puts this coat on as he argues with Sam about whether they should go after Bella or hunt Doc Benton. He wears it until the end of the episode. In Criss Angel Is A Douche Bag (4x12), Dean wears it whenever he is outside the motel room after Jeb is killed. In The Monster At The End Of This Book (4x18), Dean wears it for the entire episode, except in the motel room at the beginning of the episode and when he and Sam are in the diner. In My Bloody Valentine (5x14), Dean puts it on before handcuffing Sam to the bathroom sink and going after Famine. He is not wearing it at Bobby’s house. In Swan Song (5x22), this is the coat we see Dean wearing during the flashback to him and Sam sitting on the Impala looking at the stars. In Clap Hands If You Believe (6x09), Dean wears this coat from the beginning of the episode until he returns from his abduction. It is badly torn and muddy, and Dean presumably changes out of it for his shower. In ...And Then There Were None (6x16), Dean has miraculously repaired this coat! (or bought a duplicate) because he wears in the graveyard at the end of the episode. In How To Win Friends and Influence Monsters (7x09), Dean wears this jacket at the beginning of the episode when they arrive at the abandoned house and go over the case with Bobby. In Out with the Old (7x16), Dean wears this coat at the beginning of the episode while on the phone to Frank, and at the end of the episode starting at the point when he and Sam run to antique shop to rescue Scott. In Freaks and Geeks (8x18), Dean wears this coat when he and Sam track Krissy down at the hotel. He wears it during their first meeting with Victor, but then puts on a suit in order to interview the victim from the hotel and talk to the hotel clerk again. He then puts back on his regular clothes before driving up to the lodge where he finds the newly turned vampire girl. In The Purge (9x13), Dean wears this coat briefly while he and Sam are wrapping things up at Canyon Valley after successfully having killed the monster. In #THINMAN (9x15), Dean wears this coat at the beginning of the episode, when he talks to Sam in the bunker, and from when they go to the ‘woods’ to rescue Harry until the end of the episode. 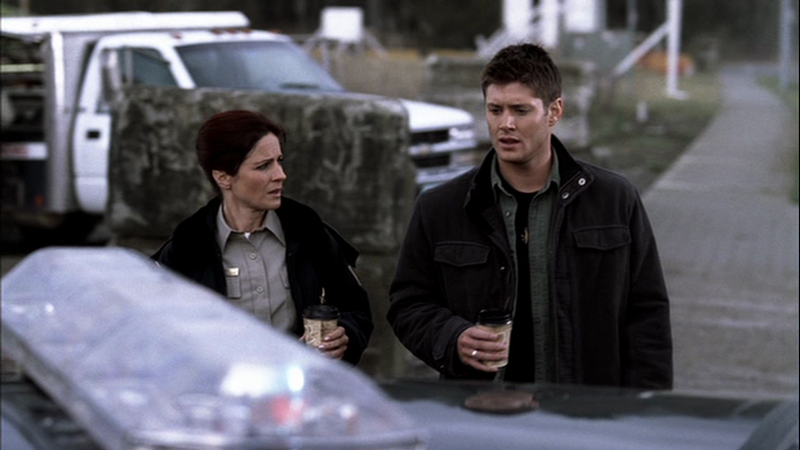 In The Things They Carried (10x15), Dean wears this coat in the car as they drive to investigate the case. In Paint It Black (10x16), Dean wears this coat whenever he is not in a suit. In The Prisoner (10x22), Dean wears this coat when he begins to track down the Stynes. When he gets captured by them, they remove his coat sometime between his capture and him regaining consciousness, and he does not wear the coat again in the episode. 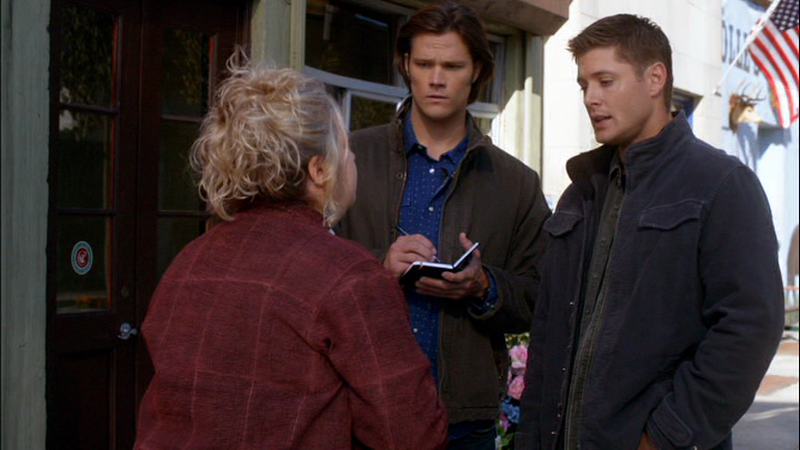 In Into the Mystic (11x11), Dean wears this coat towards the end of the episode, when he says goodbye to Mildred outside the old age home. In The Vessel (11x14), Dean wears this coat at the end of the episode when he and Sam are sitting on the pier trying to come to terms with what has happened. In The Prisoner (10x22), the Stynes remove this coat from Dean before putting him on the operating table (though they leave his other clothes on for some reason). Dean doesn’t wear the coat again in the episode, so it could be that he never recovered it... except that he suddenly has it again in S11, so he must have. Where can I get this coat? The GAP website Doesn't have it for sale. Any info would help thanks. Unfortunately, I have no idea. They probably don't make it anymore. Your best bet would be ebay, most likely. I don't know the style name though.